» Entertainment » News » Kidnappers are getting bolder. A Family in Lagos actually paid $700k ransom which is about N255m to get their father released? Kidnappers are getting bolder. 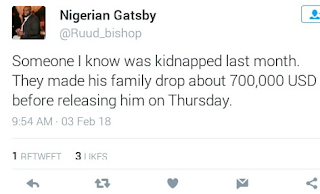 A Family in Lagos actually paid $700k ransom which is about N255m to get their father released? May be it's time prescribe life imprisonment or death sentence for kidnapping offence or has it been signed into law already? Title : Kidnappers are getting bolder. 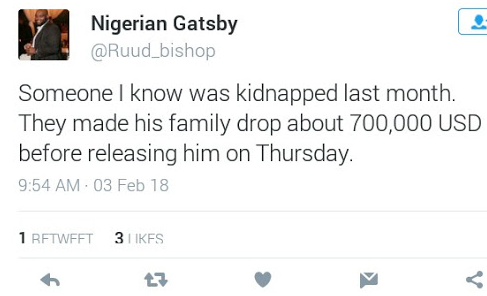 A Family in Lagos actually paid $700k ransom which is about N255m to get their father released? 0 Response to "Kidnappers are getting bolder. A Family in Lagos actually paid $700k ransom which is about N255m to get their father released?"